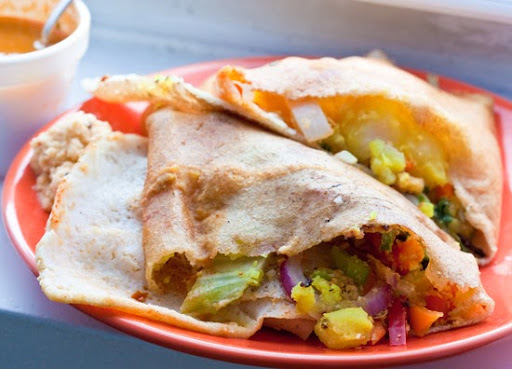 Vegan Dosa Guy! NYC Food Cart. My Foodie Adventure. 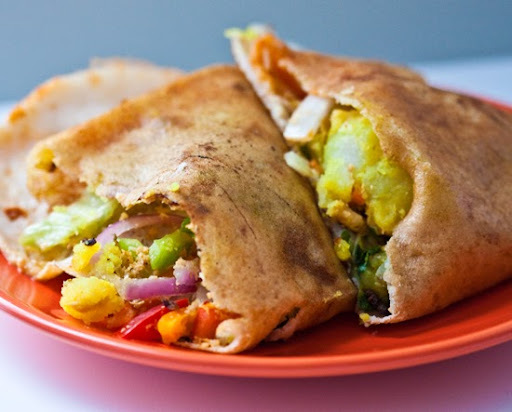 Food Cart Friday - A few weeks ago I finally found the Vegan Dosa Guy's Famous Vegan Food Cart. It was nestled under a grove of trees at Washington Square Park - a skip away from NYU, in NYC's Greenwich Village neighborhood. Food Carts and Trucks NYC. Believe me when I say I never considered myself a "food truck or food cart" kind of girl. And before moving to New York I considered "Street-side Food" to be pretty "low" - hovering right above gas station fast food. Boy oh boy, things have changed! Food carts and trucks are trendy, cool and fabulous! Foodie magnets. There's a huge number of very popular carts/trucks here in NYC. Most of them are not vegan, however. Trucks like The Big Gay Ice Cream Truck, Calexico, Wafels and Dinges, Mud Coffee Truck, Van Leeuwen Artisan Ice Cream Truck, Cake and Shake and many many more. Some carts even have a twitter account that alerts customers as to where their mobile foodie hot spot will be anchored today. Calexico tweets locations and menu specials. Wafels and Dinges does this too. NYMag even has a handy dandy Top 25 guide to the best NYC food trucks. 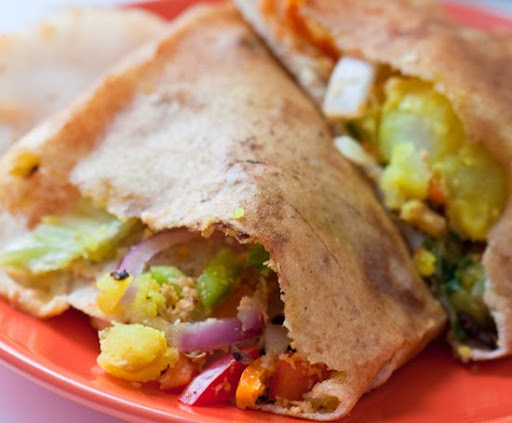 But lets get back to the NYC Vegan Dosa Guy. 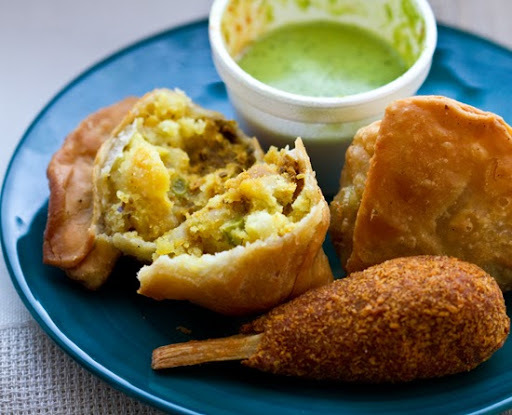 Award-winning vegan eats, served street side - Washington Square park side. 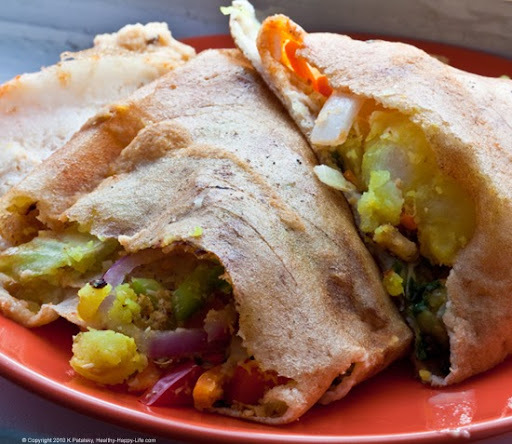 What is a Dosa??? 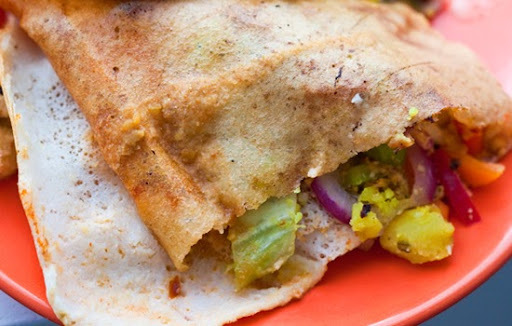 "a dosa is a fermented crepe made from rice and black lentils - South Indian cuisine." ..from Wikipedia. My Adventure. It was an overcast afternoon - and I was walking home from grabbing a chai at Starbucks. I noticed a long line of people by a food cart on 4th street - just below Washington Square Park. I knew it was the vegan dosa guy. I got in line. About 8 people ahead of me. There were lunch break guys in suits, ladies in heels palming their iPhones, a few camera-toting tourists and a few casual hungry foodies like me. Some folks ordered like pros and others had to do the awkward, but acceptable - "what's good here?" thing. I had no idea what to order. I tried to wing it by repeating what I heard someone ahead of my mumble as he ordered: "I'd like the special". But Thiru spotted my newbie status right away and starting giving me the "you want the special? 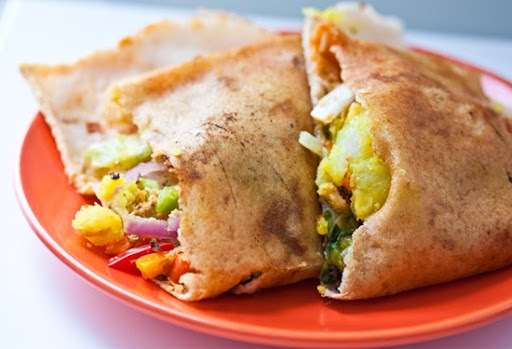 the lentil-rice crepe, wrapped curried...the one we are famous for!" He chatted cheerfully and I just nodded my head like an embarrassed foodie. Knowing fully well that there was a stacked line of ten plus people now all hoping I hurry up. At least I had my cash ready and my smile wide. At least I wasn't the one guy I saw who was fondling a $100 bill and saying to his wife, "Do you think they will take this?" They did. 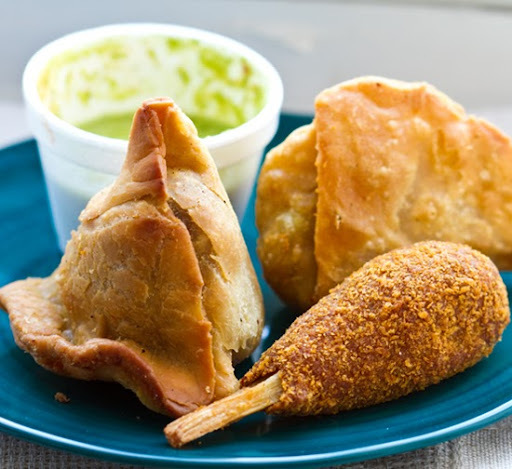 I also noticed a few folks who were just grabbing samosas and dipping sauces (no plates) - they waltzed right up to the side window and exchanged cash for eats, grab-n-go style. Meet Thiru Kumer. Note that through all this there is just one guy on the tiny grill up front (the famous dosa guy of course). There was also one helper guy collecting money at the front of the line. Nice operation. You know you're a hit when your food cart has a helper "money collector" guy. The dosa guy, aka Thiru Kumar, is always chatty and smiling in a cool calm way. I imagine he is just as calm even with a line of 50 hungry tourists wrapping around the park. He is always talking to each customer, asking them what they want and how spicy they like it He has a well-deserved slate of awards and magazine clippings lining his cart walls. Yet the cart is quite small and humble. Nothing shiny or "pimped out" like some of the newer trendy food trucks in NYC. And Thiru loves mentioning that he is "famous for the special". I had to order "the special". 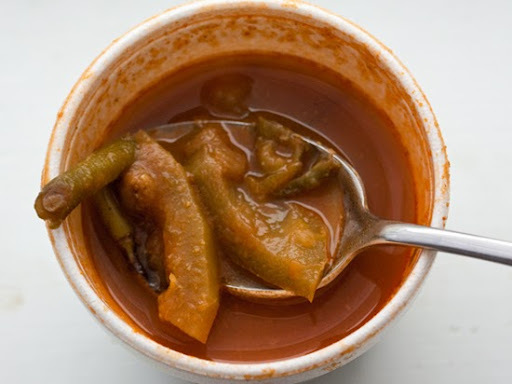 A spicy small bowl of soup. 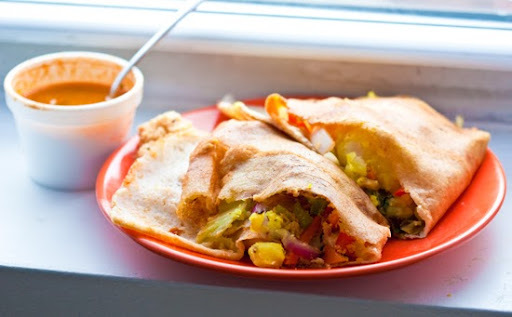 A stuffed dosa crepe and a few sauces. The lentil-rice vegan crepe is amazing! 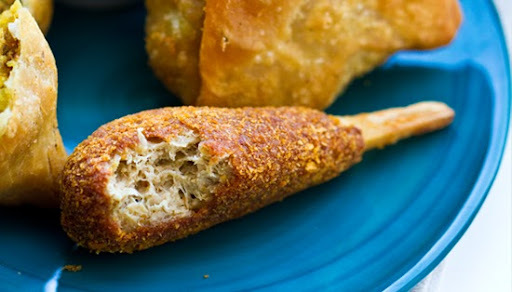 It is thin and flaky and pancake-like. 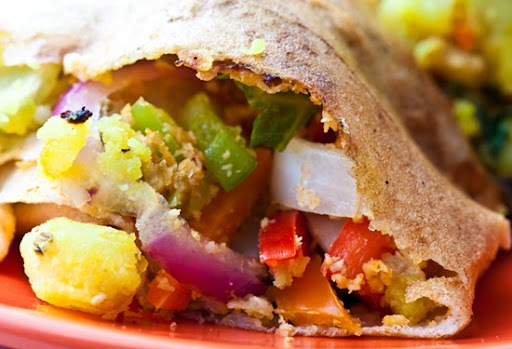 It is stuffed with curried potatoes and assorted veggies like peppers, carrots and cauliflower. So light, flavorful and healthy. I asked for spicy - and it was! The sauces were magical. 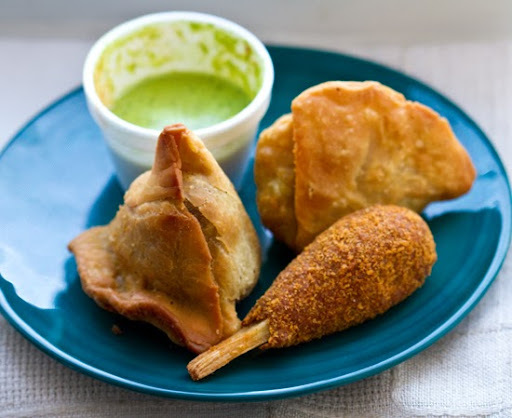 Ginger and coconut flavors soared in the thicker chutney-style sauce - and the milky pink sauce was the perfect hydration-adder to the crisp light crepe. The side soup was simple and warming. Nice touch. It had a red broth and large chunks of peppers and onion. 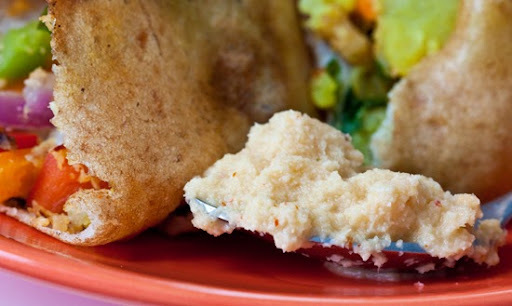 And note, I am painfully reaching for words to describe his authentic South India-style eats. At least I now know what a DOSA is. So For $6 this was quite a feast! I ordered mine to-go so I could photograph it at home. Obviously I wasn't thrilled about the Styrofoam packaging. But I noticed you can get your vegan eats served on a paper plate and eat it right away in Washington Square Park. Quite a nice idea an afternoon vegan foodie adventure if you ask me. Yay, I checked off the "Vegan Dosa Guy" and "Eating from a Food Cart" on my NYC List - all in one swoop. ...on your next NYC visit, why not check it off your "things to do in nyc" list as well!! 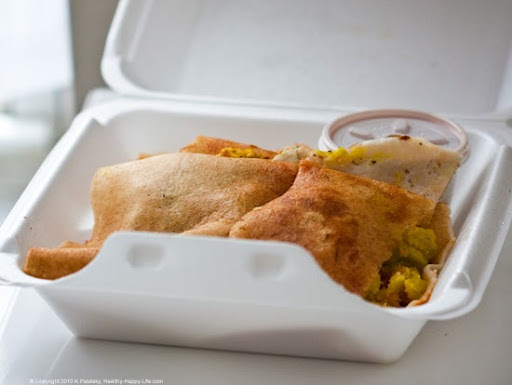 Have you ever dined at the NY Dosa truck??? let me know! What did you get? !